Casseroles are some of the most convenient and satisfying dishes. They are easy to prepare and can be made ahead of time with just a few common ingredients. 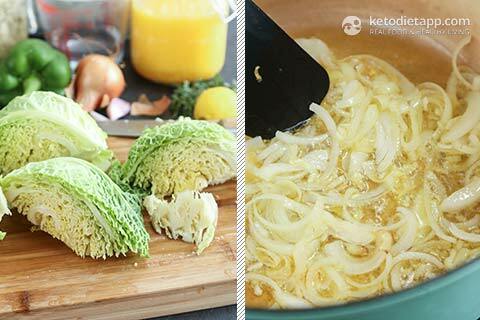 Make this keto casserole on a Sunday, and keep in the fridge ready to reheat throughout the week for an easy low-carb & paleo dinner. Optional: serve with homemade condiments such as Dijon mustard or ketchup. 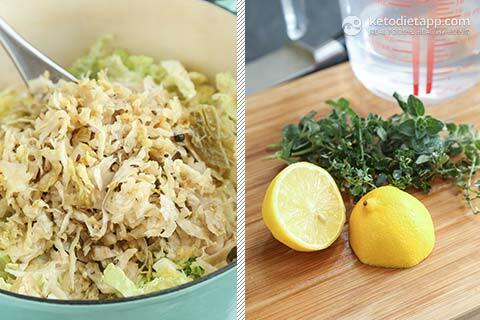 Cut the cabbage in quarters, remove and discard the core. 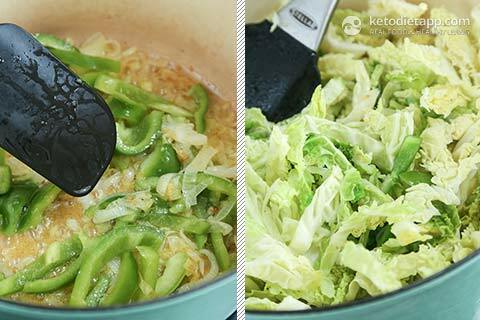 Slice the cabbage, onion, green pepper and mince the garlic. Grease a large saucepan or a Dutch oven with ghee. Add the sliced onion, and cook for 5-8 minutes, until lightly browned. ... Sauerkraut, lemon juice, water, thyme, oregano and mix until combined. Cover with a lid and cook over a medium-low heat for 10 minutes. Preheat the oven to 200 °C/ 400 °F. 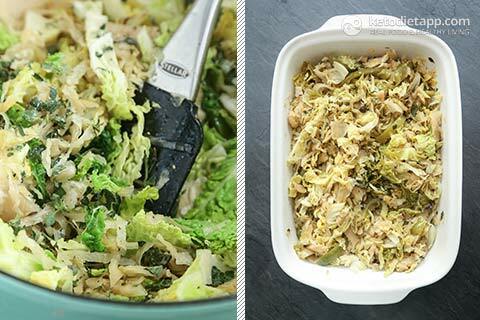 Transfer the cabbage into a large ovenproof casserole dish (or leave it in the Dutch oven if you can fit the sausages). 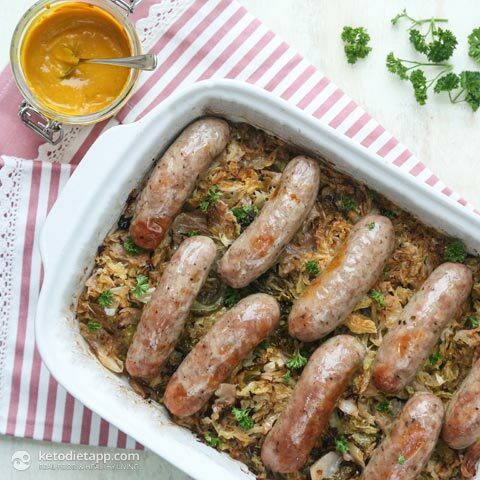 Top with sausages, cover with a lid or a baking foil and place in the oven. Bake for about 25 minutes, and then, remove the foil and bake for another 5 minutes. Remove from the oven and let it cool down for 5 minutes. Garnish with fresh parsley and serve with homemade keto Dijon mustard or ketchup. To store, refrigerate for up to 4 days or freeze for up to 3 months. Love this recipe. Just wondering if you have tried it in an instant pot? If so how did you modified the recipe to work for it. Thank you so much! I was wondering the same and I don't see a reason why not. 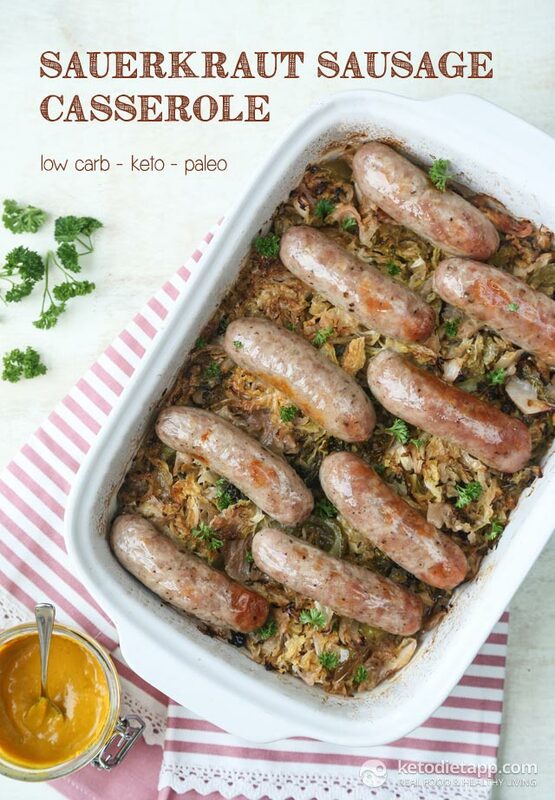 I have tried it in a slow cooker though and the sausages were amazing - so soft and flavourful! I didn't change the recipe but you could skip the water/chicken stock (slow cooker). This is definitely one of my top ten recipes. I had it without the mustard... because I started eating it so fast... then had to have another half a link after remembering (and it was AMAZING)! Thanks so much for sharing..! I always thought heat kills the benefits of enzymes and probiotics. I love sauerkraut so would save the sauerkraut to add just before serving. In the comments it show you can also prepare this recipe in a slow cooker, any tips on doing this? Thanks! 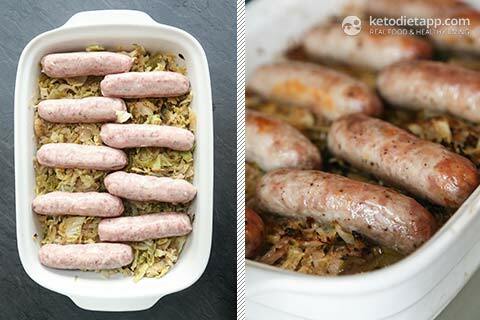 Hi Margie, I did try this in a slow cooker  I followed the recipe until step 3 and then put everything in a slow cooker, plus topped with browned sausages. Then I cooked it for 2-3 hours on high. I have made this several times and we live it. I do use butter infused olive oil and do not use the chicken broth, just the liquid from the can of SK and about 2 tbsp of cidar vinegar. Add some brown mustard and it is one of our fall favorites. Thanks! Thank you for your kind words, I'm glad it's your favororite! Bloody gorgeous. I did a similar sausage and cabbage thing last week but the sauerkraut made it sing. OH hates skt but really enjoyed this. Thank you! Modified the recipe a little to cook in slow cooker. Turned out amazing. Thank you so much. Just made this and it's really good. Will definitely add this to my menu. I halved the recipe and cut my sausage into one inch pieces and mixed it in before baking in a 8x11 dish. To me this had a milder taste than just putting kraut in a pot with the sausage stovetop style. Very filling! Thank you for your kind words, Lesa! Looks fantastic if some lowcarb biscuits are served with it!